Holiday cooking makes me think cocktail parties. 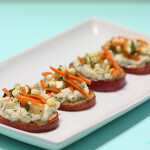 Cocktail parties make me think appetizers and, in my world, appetizers always have to include a bruschetta! Bruschetta is traditionally a grilled piece of bread rubbed with garlic and drizzled with olive oil and can have any number and combinations of toppings. 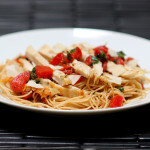 Everything from the traditional tomato basil topping to sweet dessert-like toppings can be used. 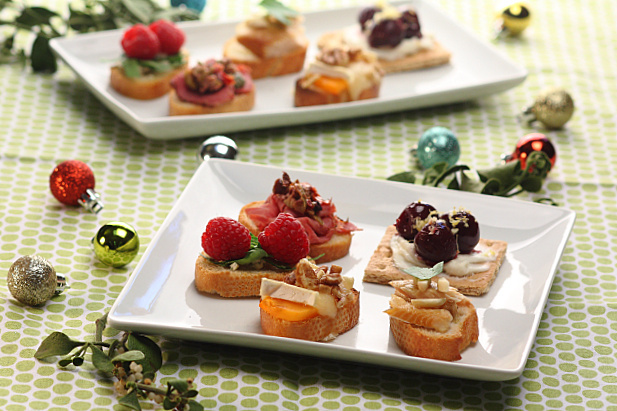 Since this tasty little concoction can be made pretty much any way you want, I thought why not simplify the holiday party and make it bruschetta-themed? 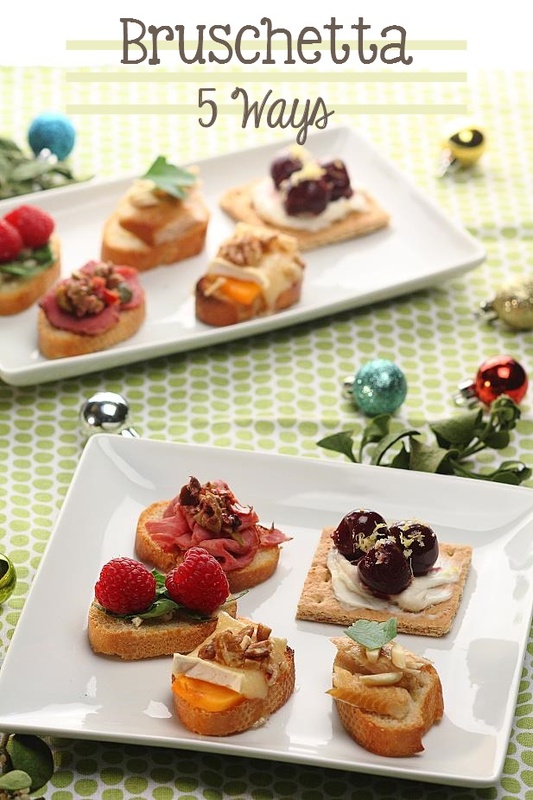 Throwing a holiday party can be stressful if you have a lot of prepping and cooking to do. 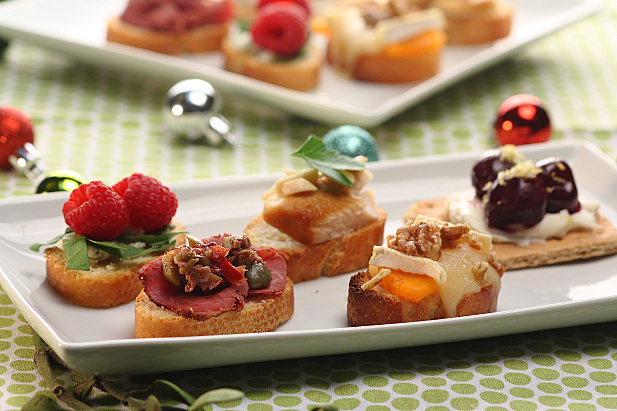 But throwing a cocktail party themed with different bruschetta can be fun and hassle-free! I came up with 5 combinations that will rock your next bash. The best part is you can prep them all ahead of time with minimal effort and then you have more time to enjoy your guests. I got all my ingredients from Whole Foods to make these tasty treats. 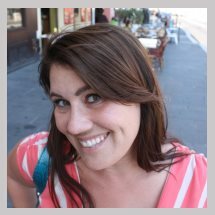 They have a huge selection of items geared towards helping you navigate the holiday food scene with ease. If you want, they’ll even prepare the whole meal for you! Check it out HERE. They also have a bunch of wonderful tips & recipes for holiday parties and decorations HERE. If you live in and around the San Diego area like me then you should definitely mark your calendars for this Thursday, December 12, from 6:00-8:00 pm. 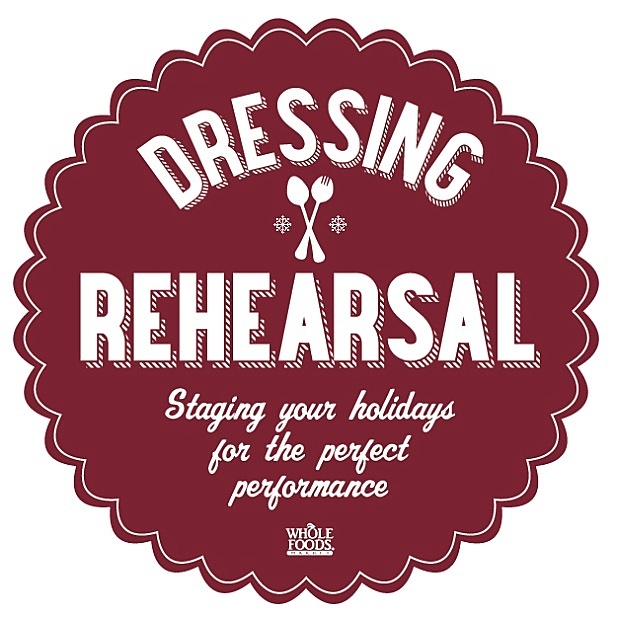 Whole Foods Encinitas is having a “Dressing Rehearsal” with free in-store holiday tasting, chef demos, sampling of delicious holiday dishes and special holiday offerings. Holiday tastings? I’m there. What’s even better? Whole Foods and I are giving away a $50 Whole Foods gift card to make all your holiday party wishes come true. Just use the widget below to enter. The gift card is good for any Whole Foods store anywhere in the U.S.! The last isn’t really a bruschetta but I had to use a graham cracker for the base in order to get that real cheesecake taste. I encourage you to also create arrangements of your own or if you want to make it really simple, just put out all the toppings and your guests can get creative. 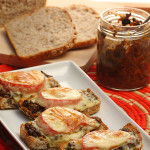 Do you have any special bruschetta combination that is to-die-for that you want to share? Drop me some deets! Disclaimer: This is a sponsored post for Whole Foods Market Encinitas. Any opinions offered are my own. Slice the baguette into 40 ½ inch slices. Place them evenly on a baking sheet and drizzle with the olive oil. Bake 8 minutes. Remove and let cool. On each of 10 of the bread slices, smash 1 garlic clove, Evenly divide the trout on top, sprinkle with the almonds and garnish with the parsley. On each of 10 of the bread slices, crumble the blue cheese. Press some spinach on each of the pieces and then add two raspberries on each, pressing lightly to adhere. On each of 10 of the bread slices, evenly divide the pastrami and spoon on ½ teaspoon olive tapenade. Place a slice of persimmon on each of 10 of the bread slices. Top with a piece of cheese. Place under the broiler 1 minute (no longer!) Remove from oven, drizzle with the honey and top with the pecans. Whip together the Neufchatel and powdered sugar with an electric mixer. Place approximately 1 ½ teaspoons of the mixture on each graham cracker piece. Top with 3 cherries. These look super yummy!! I also love stuffed mushrooms around the holidays! Tasty looking! I’ve never tried smoked trout before though. Maybe I’ll pick it up one of these days. I always seem to go for the cheese. I love Bruschetta! Or cheese and crackers! These look so yummy! I especially love that you used graham crackers for the cherry cheesecake ones. The cherry one looks good! I also like deviled eggs. My favorite holiday finger food is definitely my stuffed mushrooms recipe that I make every season. However, after seeing your bruschetta (especially the persimmon and brie!) it will easily become my new favorite! Either baked brie or what we call “pigs in a blanket”- lil smokies in half a biscuit. Cookies are my favorite holiday finger food. Half of my family sends me home baked cookies for Christmas, and I tear through those like a kid in a candy store. 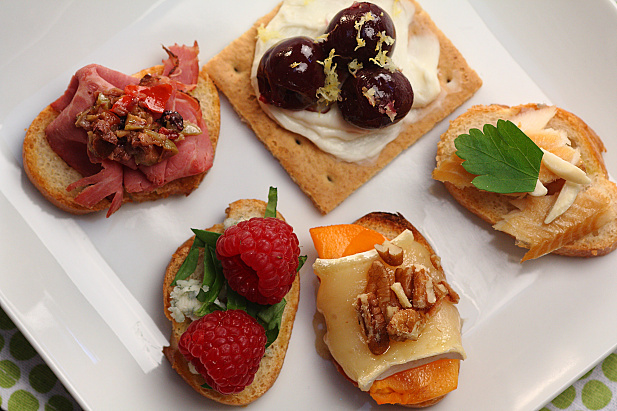 I love Bruschetta and I will take all 5! thank you! 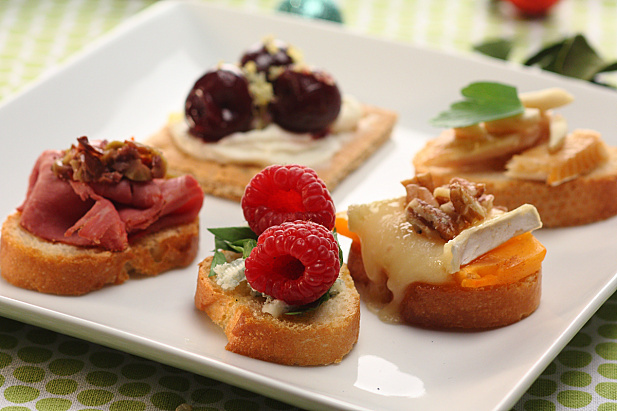 My fave is the persimmon, honey, brie…OMG it looks so good! The picture is fantastic too! cheeses! I just went to a cheese class especially for holiday platters at Whole Foods – I’m psyched to make up a great platter and add some whole grain crackers and organic jams, etc. Yess!!! I can’t resist shrimp and cocktail sauce! I love that it always seems to appear at every holiday gathering, mmmm. My favorite finger food are veggie platters. I love cheese platters at the holidays! My favorite holiday finger food is stuffed mushrooms. How fun are these! I love shrimp…especially when the tails are already off! My favorite finger food is baked brie. My favorite holiday finger food is chrusciki. I’ve never heard of this! I need to look it up. Looks amazing! I love brie and bacon wrapped dates during the holidays! 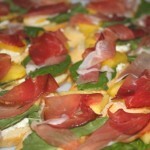 Home » Bruschetta 5 Ways, Whole Foods Event & a GIVEAWAY!